This week, the Hover Motor Company blog hit a couple of pretty neat milestones. And while I do try and keep this sort of thing to a minimum, sometimes a guy just has to toot his own horn. I posted the first car story here on August 18, 2010. The weekly car show calendar that went up on Tuesday marks the 400th story here on http://www.hovermotorco.com/. I can hardly believe that I can come up with one 400-word story sometimes, not much less 400 different stories! Most Kansas Citians are familiar with Fritz’s burger joint over there in Crown Center, because if you have kids or want to take an out-of-town guest someplace fun and different, that’s just the place to go. And really, what’s not to like? They deliver your food with a model train. That’s what I’m talkin’ about! What you may not realize is that there are two more Fritz’s locations in addition to the Crown Center restaurant. The original Fritz’s is on 18th Street in Kansas City, Kan. And then there’s the newest location, the subject of our story today, at Shawnee Mission Parkway and Pflumm in Shawnee, Kan.
Good car stuff abounds in Kansas City once again this weekend. If you like car racing, you need to be at Lakeside Speedway Saturday night when the World of Outlaws sprint cars take to the track. 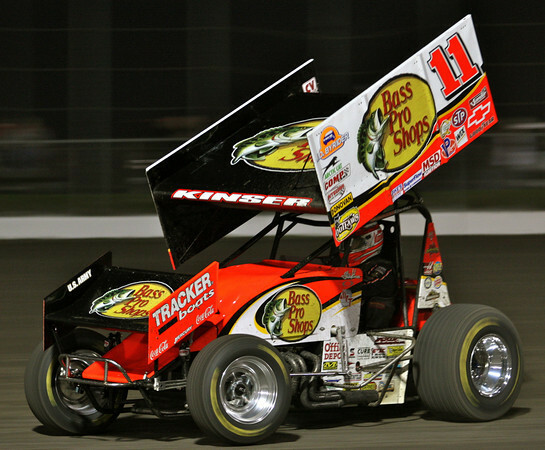 These are the same cars and drivers that compete in the famed Knoxville Nationals, and they are owned by guys like Tony Stewart and Kasey Kahne. 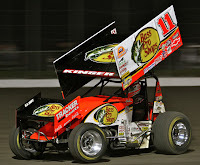 And really, you shouldn’t go through your life without seeing Steve Kinser and Sammy Swindell doing what they do best. Are there any car shows? Uh, yeah. From North Kansas City to Springfield, there are all sorts of big events happening in the area. Or, if you just want to check out an awesome cruise night, head to Liberty, Independence, Kearney, or all points in between. The entire Kansas City car show, car cruise, and car racing schedule for June 29-30 and July 1 is listed below. 2012 Art of the Car Concours at the Kansas City Art Institute gets award for "most prestigious"
Many of Kansas City’s car shows are the best of their kind for one reason or another. The World of Wheels may be the oldest. The Goodguys show is likely the biggest. The Greaserama is the most eclectic. You can go on and on. But if you want to give out the award for the most prestigious car show in Kansas City, look no further than the Art of the Car Concours, which was held on the campus of the Kansas City Art Institute. This show was created by Kansas City attorney and avid car collector Marshall Miller, and is a benefit for the KCAI scholarship fund. Kansas City has a lot of great automotive traditions. From our auto assembly plants to our local car racing, this cowtown keeps the wheels turning. We also have several significant, long-running car shows here. 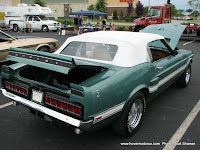 And for 28 years, one of those shows has been the Mustang and Ford Show, presented by the Mustang Club of Kansas City. Held at the Bass Pro Shops in Olathe, this is the show where all the high-interest Blue Ovals, both old and new, gather each and every year. A new week, a new selection of links for this week’s Thursday Drive-By. Gotta love the Internet. Two of these are inspired by Disney, including the new Carsland at the Disney California Adventure Theme Park, and a great look at cars of the future—as told in 1958. From the same era, we have another Hollywood-inspired link with the classic TV show Highway Patrol. Man, those old mid-‘50s Buicks really leaned over in the corners! Check out all the fun links in this week’s Thursday Drive-By. Sounds like it’s going to be hot and sunny this weekend in Kansas City. That’s perfect weather to go to a local car show and work on your tan. One of the biggest events of the year is the Art of the Car Concours at the Kansas City Art Institute. They really come up with some amazing cars at that one. My dad’s ’61 Corvette was actually selected as one of the participants this year, so I’ll be there pretty much all day Sunday babysitting his car with him. Of course, if you want a more casual car show atmosphere, there are several great cruises and shows all over Kansas City. Just make sure to bring the sun screen. The entire calendar of Kansas City car shows, car cruises, and car races, plus this weekend’s NASCAR schedule, is listed below. The Riverside Red X monthly cruise has the potential to be a pretty nice gathering. Too bad more people don't attend it. It seems like the eclectic shopping center has been trying to have a successful cruise for years. Sometimes they get a few cars, but for the most part, attendance has been fairly spotty. So instead of scheduling it in the evening like a normal cruise, this year they decided to try and have them on Saturday afternoons at 2:00. The idea was to keep it from conflicting with other cruises in the area. One of the car cruises that everyone seems to look forward to in Kansas City is the KCI Airport Cruise, which is held at the old Ambassador Building in northern Kansas City. But if you had been paying attention to the weather forecast for this year's installment, you may have had your doubts that it was even going to happen. Storm warnings were north of town, the wind was blowing like 100-miles-per-hour, and there were some spooky looking clouds off in the distance. If you look around at some of Kansas City’s vintage architecture, you’re probably noticed that many of the buildings, walls, and structures are constructed of limestone. That’s because there are tons of limestone deposits around here, and it makes a cheap, durable, and beautiful construction material. Obviously, to get to the limestone, they had to mine for it underground. And an interesting side effect of that mining is that Kansas City now has a huge underground cave system. Most of these caves were carved out in such a way that now retail businesses are able to set-up shop in the strangely comforting, almost surreal lair that limestone mining left behind. We’re looking at old cars and new cars, new cars built to look like old cars, restored show cars, and old cars that need to be restored in this week’s Thursday Drive-By. Confused yet? That’s OK; I’m not doing much better. But we have links from sources like Autoweek, Hemmings, Automotive Traveler, and the Autoextremist. So get on out there and explore the World Wide Web. Just try not to get so excited that you forget to come back here sometimes. Check out the links below. Of course, Father's Day is Sunday, and it makes me think about a couple of my favorite people: my dad and my son. The only reason I bother doing this silly blog is that I love cars. I place the blame for that affliction squarely on the shoulders of my dad. He forced me to do car stuff constantly. Against my will. He ruined me. In fact, I am so screwed up, I am doing the same thing to my son. He’s only eight, but he is getting an extensive early automotive education. He has been to races, car shows, auctions, demolition derbies, monster truck shows; I make him help me wash my car. I feel sorry for him. This is another big weekend for car-related stuff in Kansas City, highlighted by the big KCI Cruise at the Ambassador Building near the airport. They always have some great door prizes and a huge turnout at this one. Another one worth checking out is the Firefest at the Independence Events Center on Saturday. I’ve been to this before, and it is a really fun, family-friendly event with lots of old cars, vintage fire trucks, and lots of other things to see and do. If you’re in the Independence area, I definitely recommend it. I also want to give a shout out to the Riverside Red-X Cruise. It’s kind of at a weird time at 2:00 Saturday afternoon, but I like those guys, and would like to see that event take off. So if you can make it, give the Red-X a try. The entire Kansas City car show, car cruise, and car racing schedule is listed below, plus the NASCAR TV schedule from Michigan. Oh, and happy Father's Day! Model cars are great, aren't they? You can build or own anything you want, and it really doesn't matter how weird or crazy it is. Nobody wants a '57 Chevy Bel Air with a six-cylinder in it, but put one in a model and it's kinda neat. Likewise, most people don't have a stock-appearing V8 Chevette, but in a model, why the heck not? For skilled model builders, the only thing that limits what gets produced is their imagination, and honestly, there aren't many restrictions on that. So it can be a real treat to go where some of the best modelers in the Midwest have gathered to check out the Heartland Model Car Nationals. As in most years, this was held at the Overland Park Convention Center, and there were lots of great models to see, critique, and even buy if you are so inclined. Here we are, closing in on the dog days of summer. Temperatures were over 90-degrees on Saturday, and air conditioners were getting a workout. Of course, that also means that the car cruise season is in full-swing, and evidence of that could be found in North Kansas City during their "Second Saturdays" event. We’re taking a look back in time for this week’s Thursday Drive-By. We’re looking at automotive styling from the past. We’re looking at shopping malls of the past. We’re looking at magazines from the past. We’re looking at Ferraris of the past. And we’re looking at roadside signage from the past. One thing you’ve got to love about the Internet is that no matter how old or obscure the subject matter is; no matter how much you thought certain things only existed in your memories; somewhere, someone has pictures and information that they are willing to share. You wouldn’t think something like the Web would be the quintessential source for all things nostalgic, but in some ways, it really is. Take a look at all the cool car-related stuff in the links below. Fiesta Italiana Car Show. That's amore! The smell of fried ravioli was in the air during the Fiesta Italiana at the Zona Rosa shopping area. And although most people were there for the live music, the street vendors, and the cannoli eating contest, there was, in fact, an Italian car show tucked quietly in one of the side streets. I actually didn’t even know about this one until I saw a poster hanging in an Italian restaurant the night before. That’s why it wasn’t in my weekly calendar. And I didn’t really know what to expect. Whether you like your cars full-sized, or you’re into something a bit smaller, there’s plenty to do around Kansas City this weekend. For scale model enthusiasts, the Heartland Model Car Nationals will showcase all sorts of talented scale model builders, plus there is a nice swap meet where you can buy model cars of your own. It’s a pretty big event in the model car world around here, and one you won’t want to miss. If you like your cars in 1:1-scale, there’s plenty for you too. North Kansas City, Basehor, and Independence all have big cruises this weekend. There’s a big MOPAR show in Olathe. Or check out the Fieros at the City Market. I didn’t write a story about it, but I watched the races at Lakeside Speedway last Friday night. They had at least 100 race cars, and the action was fast and entertaining. BHo is eight-years-old, and he was glued to every single lap. Oh, and they’re back at it again this Friday. The entire car show, car cruise, and car racing schedule is listed below.